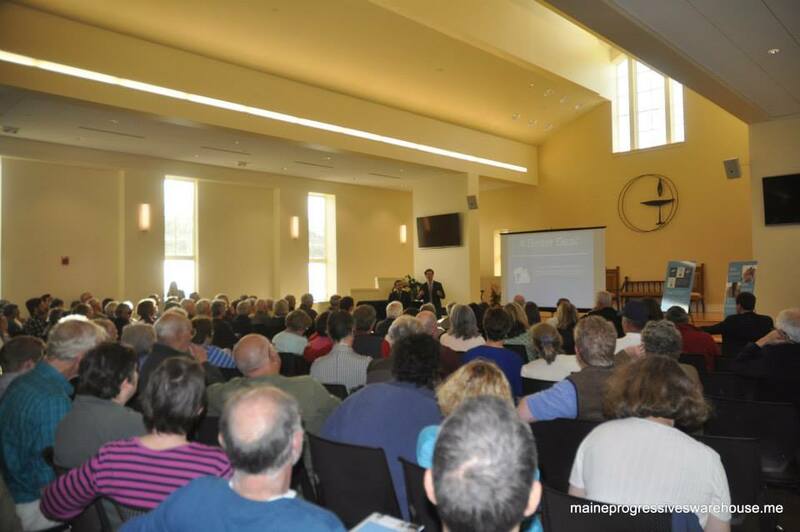 Maine Governor Paul LePage found himself in hot water recently, as his racially-charged comments made regarding Maine’s heroin crisis at a Bridgton town hall event made international news. AUGUSTA- Governor Paul R. LePage will hold a news conference at 10:00 AM in the Cabinet Room to discuss his recent remarks regarding Maine’s drug crisis. All verified media is welcome to attend. Here is full video from that press conference. Here are a few parsed out moments from the press conference. The governor will conduct another public town hall event tomorrow evening in Windham. Full video of the event, recorded 12/8/15, here. Senate Minority Leader Justin Alfond (D-Portland) spoke with the media after the conclusion of the town hall. Join House Speaker Mark Eves and Senate Democratic Leader Justin Alfond for the third town hall meeting on the Better Deal for Maine plan. 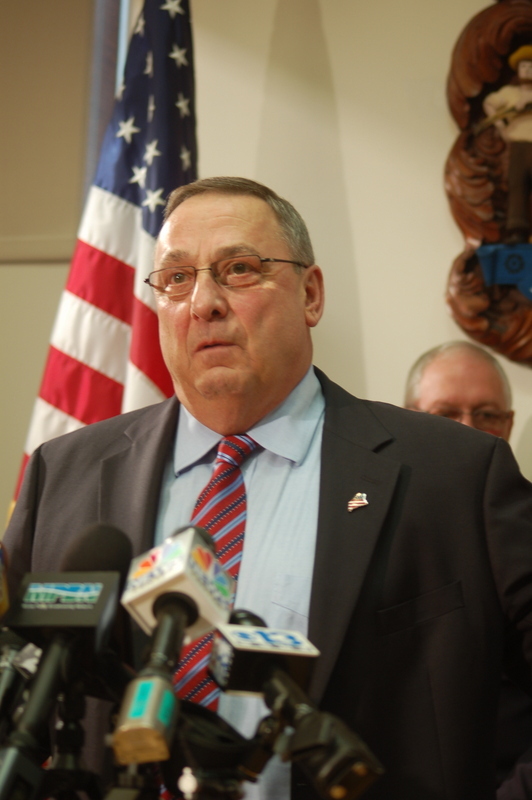 The Better Deal for Maine rejects Governor Paul LePage’s trickle-down economics. It is a tax reform plan that grows the economy from the middle out, not the top down. It cuts taxes for the middle class, lowers property taxes for all Maine homeowners and invests in Maine schools, workers and communities. Below are the videos of the full event, held at the UU Church in Brunswick last night. Attendance was high and the questions ranged from the Democrats’ plan to other issues being weighed in the Legislature and Augusta currently. Unlike the Governor’s events, neither the questions nor people asking them were not screened before speaking. Top Democratic leaders in the State House on Thursday countered Gov. Paul LePage’s budget with their plan to grow the economy from the middle out rather than the top down. Speaker Mark Eves, Senate Democratic Leader Justin Alfond, House Majority Leader Jeff McCabe and Assistant Majority Leader Sara Gideon announced the plan at Cony High School, which is in a school district that could see a $1 million cut in funding if the governor’s budget passes. Puts more money in the pockets of Maine families: Cuts property taxes by $120 million annually for Maine residents by doubling the Homestead Exemption for all Maine homeowners and by increasing the Property Tax Fairness Credit by more than $57 million per year. Invests in Maine’s future: Bolsters investment in Maine students, workers and seniors. Increases funding for K-12 education by $20 million per year. Prevents property tax hikes: Increases revenue sharing to $80 million each year for local services like police, fire, and public works, while rejecting the governor’s new taxes on non-profits. Targets income tax cuts for the middle class: Cuts income taxes by hundreds of dollars for the vast majority of Maine families while asking the wealthiest 5 percent to pay their fair share. Under the Better Deal for Maine, 98 percent of income tax cuts go to the bottom 95 percent of taxpayers. Under the governor’s plan, 50 percent of the tax break goes to the top 10 percent. Is fiscally responsible: Unlike the governor’s budget, the Better Deal for Maine is fully paid for now and into the future. Sen. Justin Alfond, Sen. Anne Haskell, Rep. Mark Dion, Rep. Diane Russell, Rep. Drew Gattine , Rep. Peter Stuckey, Rep. Erik Jorgensen, Portland Mayor Michael Brennan, Portland City Council Ed Suslovik, Preble St ED Mark Swann, and many others at 2/27/15 Oxford St Homeless Shelter press conference. 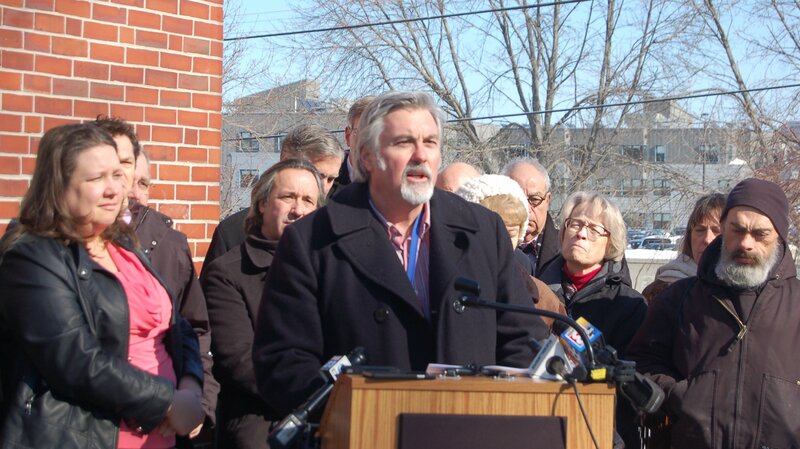 At the end of the coldest February on record in Maine, political leaders and homelessness advocates held a press conference in Portland to discuss the needs of some of the region’s most needy and address the attacks by the LePage administration regarding the city’s spending of General Assistance monies. A reminder: this is part of an ongoing legal battle between Portland/ Westbrook and the state over GA funds. Alfond, Portland Mayor Michael Brennan and others on hand at the shelter Friday said they can explain why Portland seems to have an outsized share of the state’s General Assistance allocation, but that they can’t get a prompt audience with LePage or DHHS Commissioner Mary Mayhew to discuss it. “We want the coordinated attacks on Portland to end, and the work to make our social services better to begin,” Alfond said, pointing out that Portland is not only an “outlier” in its distribution of General Assistance funds but also in that it represents an outsized share of the state’s economy. Alfond acknowledged Friday the audit was “troubling” and that Portland’s city officials and state representatives were eager to meet with the administration to discuss ways the city could better administer General Assistance. Brennan said he called the governor’s office on Monday to set up an appointment to discuss the audit. At 8 p.m. last night it was 12 degrees. And it’s March–not January. Together we’ve experienced one of the longest, most frigid, and snowiest winters in history. Good Morning. This is State Senator Anne Haskell of Portland. And, I don’t really want to talk about the weather. But I do want each of us to stop for a second and think about a time this winter: Think about the ten minutes it took you to walk from your office to your car on a blustery cold day. Your cheeks froze. Your fingers and toes hurt and you couldn’t wait to seek shelter from the wind. What if you didn’t have a home. If you didn’t have a place where you could crank the heat, pull up the blankets, and settle in with a cup of tea. What if, at sun down, you had stand in line for hours with the hopes–not the guarantee–that you could get a mat to sleep on at a shelter. A mat, by the way, that is only three inches thick. A mat that is placed in an open room–flanked on each side by strangers–only five inches from you. Clutching all that belongs to you, in a bag or a backpack. Mark Swann, the executive director at Preble Street in Portland, said, one day this winter, there were 282 people who showed up for one of the 142 mats. The math on this one is easy: 140 people were left to find shelter elsewhere that night. Some slept on the floor of the soup kitchen down the street. Others, had to sit up in chairs all night at city offices. And, a few others waited at the shelter–hoping a mat would open up. One person waited 11 hours; only to lay his head for two hours before the morning came, and the shelter closed for the day. Nobody chooses to be homeless. Nobody chooses to be mentally ill. Not one of the 282 people who lined up at the Oxford Street Shelter that night was trying to get away with something. Nobody working at the shelter or the city who is trying to provide life-saving shelter is trying to get away with something. 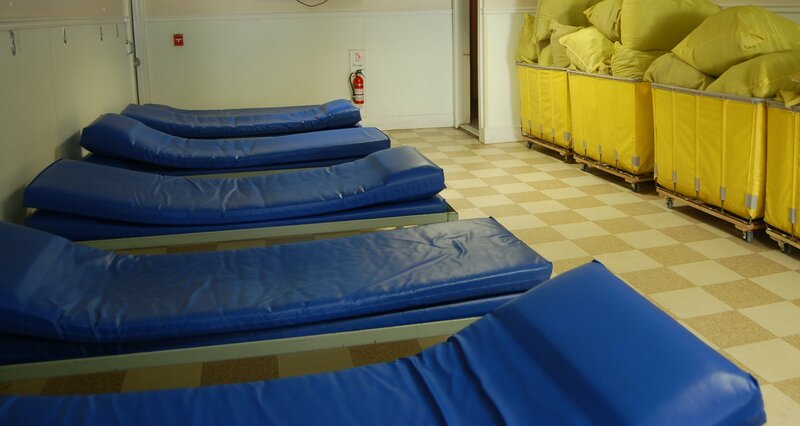 At its core, this service of providing EMERGENCY shelter is serving the most basic and fundamental and crucial needs of humanity. Yet, in recent weeks, it’s become a political football. The LePage administration has attempted to garner salacious headlines by vilifying the people who utilize the shelter, and also those who provide the service. It’s not an easy story to tell. Why? Because we are talking about mental illness. We are talking about diseases like Schizophrenia. Recently the City of Portland studied 30 of the so-called “long stayers” at the shelters. What did they find? All of them, 100% had serious and persistent mental health issues–often untreated. Some had money in the bank. Some even had thousands of dollars in the bank. It could mean many things. For some, it means that perhaps a special account was set up by family members to put money aside for them. Perhaps intended to pay for things like dental and medical care. For some, it could be the remnant of another time in their life–before they got sick. For all, it is money that–because of their psychosis, they are unable or unwilling to use. They are not staying at homeless shelters to save a buck. They are staying there because they believe staying at a shelter is the best option available to them. And…most importantly, they are not numbers on someone’s spreadsheet. They are our brothers and sisters, our parents, our aunts and uncles. They are our fellow human beings–living much more difficult lives than we can imagine. Mental illness is not easy to understand. But it is something that we all need to take a closer look at. We can’t be afraid of it. And most of all, we can’t play the blame-game–that serves no purpose other than to distract and delay from a meaningful solutions-based dialogue. Long before this administration, the mental health system in Maine has been broken. The overflowing shelters in our state is one symptom of that–as are our jails–that are also overflowing with people who would benefit more from mental health intervention and treatment. As a member of the Health and Human Services Committee and a former member of the state’s Criminal Justice Committee, I can tell you that there are dozens of lawmakers who are interested in solving this problem and helping our fellow Mainers who are suffering. But the first step toward a solution has to be one that is honest. Sad news to report, as it was announced last weekend that former State Senator Joe Brannigan (D-Portland) passed away last weekend. Brannigan served 28 years in the Maine State Legislature: seven terms in the Maine House from (1979-1986, 2001-2006) and seven terms in the Maine Senate (1987-1994, 2007-2012). He served on ten committee, most notably, on the state’s budget writing committee, Health and Human Services, Insurance and Financial Services, and State and Local Government. During his time in the Legislature, Brannigan led the way on issues such as access to mental health services, expanding health insurance to low income Mainers, bail reform, and strengthening Maine’s “lemon law.” In 2010, Brannigan retired from 34 years of service as the Executive Director of the Shalom House, a housing and mental health program for adults with severe mental illness. Democratic leaders had waited for more than two months for an opportunity to speak with Governor Paul LePage on a number of concerns, not the least of which were the troubling news of Riverview once again failing to qualify for federal re-certification and final resolution of the monies owed back to the state from the Alexander Group for their now widely discredited and plagiarized report. A reminder: It was reported back on May 23 that Maine had finally suspended payments to Alexander and at that time, Paul LePage indicated that the option was on the table. He added that the state may attempt to reclaim the $500,000 it has already paid The Alexander Group. “It’s all a matter of the extent of what the damage is,” he said. Apparently “the damage” ultimately wasn’t that bad in Paul LePage’s eyes. Yesterday Democratic leadership finally got their chance to question the governor and others, albeit in a closed door meeting. The news for Maine was pretty bleak, as LePage now has no intention of recouping the $475,000 already paid to the Alexander Group. During the meeting, the Governor reiterated the administration’s position that it was confident the state would correct problems at the Riverview Psychiatric Center despite a recent failed bid to qualify for federal re-certification. The state psychiatric hospital lost its certification last September due to mismanagement and dangerous conditions at the hospital. As a result, the federal government said it could [hold back] approximately $20 million in funding for the hospital. Senate President Justin Alfond (r)answers questions at weekly media availability meeting as Speaker of the House Mark Eves (l) looks on. During the meeting, Governor LePage complained that lawmakers did not pass his 11th hour proposal to increase funding for the Maine Drug Enforcement Agency. The bipartisan Appropriations Committee passed an amended bill to include funding for substance abuse treatment. At the time, the Governor said he would veto anything but his original proposal so no further votes on the bill were taken. “The Governor sat on the sidelines when lawmakers were doing work, whether it was the budget or other important bills. He continues to blame others for his unwillingness and inability to work constructively with the legislature,” said Senate President Alfond. “The Alexander Report has been a case study in government waste and poor judgment from the very beginning,” Michaud said. 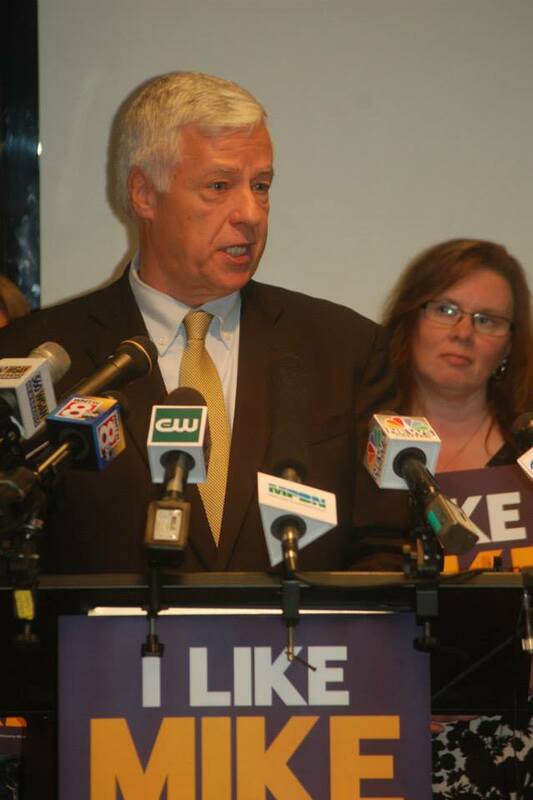 Michaud released a plan earlier this year to appoint an Inspector General for the Department of Health and Human Services and cited the ongoing scandal revolving around the Alexander Report as an example of one of the many issues of waste and mismanagement the office would be tasked with preventing. Not quite accurate, as the federal government is demanding Maine pay back monies dating back almost a year and will be still on the hook for a hefty sum, even were the hospital to become re-certified. “We will be seeking the return of that money because the facility has been decertified,” Richard McGreal, associate regional administrator for the Centers for Medicare and Medicaid Services, told the Press Herald this week. If Riverview becomes certified, federal money will flow back to the center. But even then the center would not be funded retroactively, and Riverview will still owe the federal money it has used in the months it was ineligible, McGreal said. State officials said they have not been told of the pending “disallowance” action and have been drawing from the federal account the entire time. Maine is entitled to $20 million per year in federal money to operate Riverview, representing more than half of the hospital’s $36 million budget. Drug testing of convicted felons who are applying or receiving welfare is nothing new. In 2014, at least 18 states introduced plans that would require drug screening or testing for welfare applicants or recipients. Today, I am announcing that the Maine Department of Health and Human Services is moving forward with its plan to conduct drug tests of convicted drug felons who are applying for or receiving welfare benefits. Over the last several months, the State has been focused on drug-testing measures that not only ensure privacy and fairness, but also reinforce accountability in the program. The tests will be required for drug felons who receive Temporary Assistance for Needy Families or TANF. Federal rules support drug testing as part of the federal TANF money that Maine receives. When people apply for welfare benefits, they must report whether they have a prior drug-related felony conviction. If the answer is yes, the State will schedule a drug test and notify the individual 24 hours prior to the actual test. If a person tests positive, they will have the option to be tested a second time. At any time, an individual can avoid termination of benefits by enrolling in an approved substance abuse program. Those who fail to disclose they are convicted drug felons will lose their welfare benefits immediately. Our welfare programs, including TANF, are designed to be a short-term benefit that assists families and children with the basics of everyday living. If someone tests positive, they are putting their drug habits or addictions ahead of their family’s needs. We must do all that we can to ensure children’s needs are being met and that TANF recipients have the best possible chance at economic independence. Being drug-free is a critical aspect of escaping from poverty and moving toward self-sufficiency. Protecting the trust of taxpayers is one of my greatest responsibilities. I will do everything in my power to ensure welfare benefits are used for the truly needy and not provided to support people’s drug habits or addictions. However, it’s no secret: Maine has a drug problem. When we identify people who are on drugs, we must make an effort to help them break their addiction. Our welfare system depends on it, but more importantly, our society does. If you have a drug problem or know someone struggling with addiction, the State has resources to help. Please call 2-1-1 and someone will help you find services in your area. Addiction does not have to control your life. Again, call 2-1-1 for help today. Democratic leaders Senate President Justin Alfond and Speaker of the House Mark Eves have issued their own responses in a press release, agreeing with the Governor’s statement that this is “nothing new” while accusing the chief executive of politicizing enforcement of a three year old law. More later on the Mike Michaud proposed “Inspector General for the Department of Health and Human Services” mentioned in the release- here is a clip from his June press conference, rolling out the idea to Maine media in Augusta. AUGUSTA — Top legislative leaders on Wednesday said Governor LePage’s latest announcement that he’ll finally enforce a 2011 law* to drug test convicted drug felons whose families rely on temporary assistance from the state is just the latest in his campaign effort to distract from his lagging economic record. The leaders also said the Governor’s failure to enforce the law was another reason to support an independent Inspector General for the Department of Health and Human Services. Earlier this week, Business Insider ranked Maine 47th for economic growth in the country, so now the Governor is stepping up his welfare rhetoric. According to national labor statistics, the country has recovered 106 percent of the non-farm payroll jobs lost during the recession. Regionally, New England has recovered 116 percent of jobs. Maine lags behind, recovering only 63 percent of the jobs lost in the recession. Under Paul LePage’s economic leadership, Maine has experienced, a job creation record among the worst in the U.S. since the bottom of the recession, ranking 42nd out of 50 states in the latest report (June 2014). Additionally, Maine has the 5th highest rate in the country of people who work only part-time because they can’t find full-time jobs. 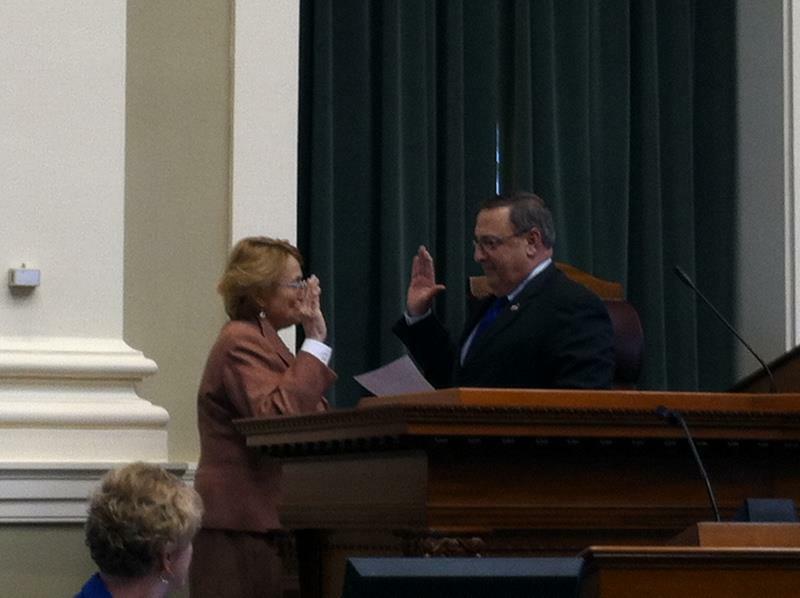 December 5, 2012- Governor Paul LePage swears in the newly elected 126th Legislature. He had previously enjoyed Republican majorities in both chambers with the 125th Legislature; that was erased in the November elections, as Democrats retook both the House and Senate. 12/12/12- Forbes ranks Maine as the worst state for business for the third year in a row. 12/14/12-The world learns of a horrific mass shooting at Sandy Hook Elementary School in Newtown CT, as 20 children and 6 teachers are slain by a single gunman. 12/17/12- LePage orders that the flags across the state be lowered to half-staff immediately through sunset on the following day, in accordance with a Presidential proclamation. 12/19/12-Governor LePage announces a moment of silence for Friday, Dec. 21 in memory of the Newtown, CT victims. 12/19/12- While delivering the keynote speech at a Bangor Region Chamber of Commerce breakfast, Governor LePage agrees with Forbes’ assessment, blaming the state’s economic woes on a variety of factors including high energy costs, the $484 million in overdue Medicaid reimbursements to the state’s hospitals, “generous welfare” spending and the “double dipping” of school superintendents. 12/21/12-Senator Dawn Hill (D-York) is appointed Senate Chair of the Joint Standing Committee on Appropriations and Financial Affairs for the 126th Legislative session. 12/27/12- Governor LePage issues an executive curtailment order to reduce state spending by $35.5 million for the fiscal year ending June 30, 2013. 1/4/13- Aroostook Watchmen radio show hosts discuss on-air that Fort Fairfield Journal editor David Deschaine is “an ideological ally” of theirs. Here is a 2014 article written by Deschaine, “Feds Back Down After Hundreds of Militia Show Support for Nevada Rancher”,, in sympathy with the land ownership and property rights claims of Cliven Bundy. Governor LePage administers the oath of Office to Attorney General Janet T. Mills of Farmington. 1/4/13- The state’s budget-writing Appropriations and Financial Affairs Committee convene to begin reviewing the impact of the $35.5 million spending curtailment cuts, as part of a larger supplemental package needed to close a projected shortfall of $100 million in Department of Health and Human Services’ (DHHS) budget. 1/8/13- Governor LePage swears in Maine’s three Constitutional Officers (Secretary of State Matthew Dunlap, State Treasurer Neria Douglass, and Attorney General Janet T. Mills) and Statutory Officer (State Auditor Pola Buckley). 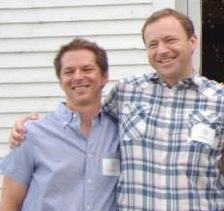 Dunlap and Mills had both previously served in the same offices under LePage predecessor Democratic Governor John E. Baldacci. 1/8/13- In Alaska, Sovereign Citizen Francis August Schaeffer Cox aka “Schaeffer Cox” is sentenced to twenty-six years in prison for conspiring to murder federal and state government officials, including judges and law enforcement agents, and for stockpiling illegal weapons and explosives. 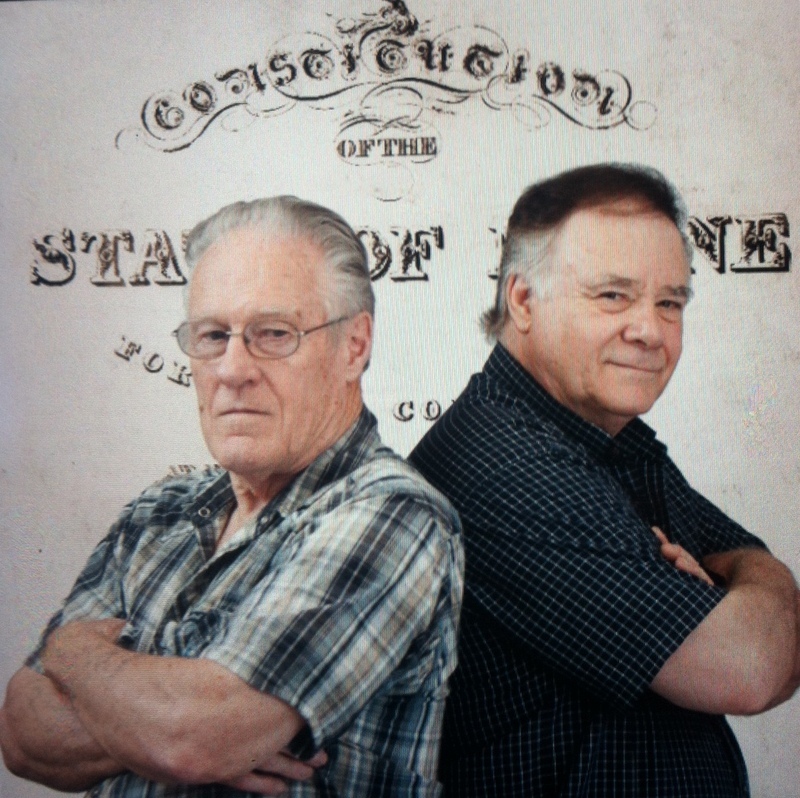 Image used as icon for “The Sovereign Family” Radio Show, hosted by Jim and Trisha White, aired on the same stations as the Aroostook Watchmen and promoted by same. Cox served as an Alaskan delegate to the “Continental Congress 2009”, which saw 116 delegates from 48 states in attendance. Some members of the “Constitution Club” offer support comparing him to “Samuel Adams and the Sons of Liberty” and others wish to distance themselves from Cox. Maine’s three “Continental Congress 2009” delegates are listed as Wayne Leach, Jack McCarthy, and Alan Lowberg. 1/11/13- Officials from the LePage administration present the governor’s budget to the state and his office releases a statement from the governor, blaming the federal government and Medicaid for Maine’s fiscal woes. 1/12/13 the Monticello-based “Aroostook Watchmen” radio show hosts discuss plans to deliver a “remonstration” (EP1129-“A remonstrance to Maine State government”). They opened the show with a Scripture verse, then discussed translating it as being directed to sell one’s clothing for weapons to arm one’s self. Roger Ek’s show is first referenced at the 3:45 mark; Jim and Trisha White of “Sovereign Families” at the 4:11 mark. 1/14/13- A group calling themselves the “Maine Constitutional Coalition” (leader Wayne Leach, Aroostook Watchmen host Jack McCarthy and others) submit a set of “remonstrances” to Maine Senate President Justin Alfond, Speaker of the House Mark Eves and Governor LePage at the State House in Augusta, accusing all of acting unlawfully and declaring that they must surrender their elected offices. 1/17/13- Coalition member Gary Smart posts an “Introduction to the Remonstrance”, signed himself and the other three coalition members: Wayne Leach, Phil Merletti and Jack McCarthy. You are most likely aware of the enormous problems existent in America, at all levels, most of which were created and/or exacerbated directly by burdensome government rules, regulations, requirements and policies. This especially holds true for Maine. The People have endured egregious violations committed by government against their rights for many, many years, and this must come to a rapid halt. To that end, we have put together a Declaration, Remonstrance and Demand to be presented to the governor and the members of the Legislature when there are ENOUGH SUPPORTERS behind this proposal who will actively work to implement its provisions. Many causes exist in Maine, with many different, diverse groups espousing individual positions. Virtually all of these are valid, but the one common denominator that occasions the need to champion these causes is the fact that the elected and appointed officers in Maine in virtually all positions do not honor their oaths and instead routinely violate them, as well as the rights of the People. This document references and makes provisions to correct such situations. 1/19/13-Assistant Majority Leader Senator Troy Jackson (Allagash) points out in a weekly Democratic radio address that the recently released LePage budget in its current form would “dump more than $420 million dollars worth of problems” with its zero revenue sharing from the state to municipalities and shift the financial burden onto them by withholding nearly $300 million in “revenue sharing” dollars from Maine’s towns. “A Remonstrance was served on Maine’s Governor Paul LePage on 14 January, 2013 (1/14/13) asking that wrongs upon the people of Maine be addressed and a receipt was obtained. The Governor was asked to respond within ten days. There was no reply to this Remonstrance. On 30 January, 2013 (1/30/13) a press conference was held in the Capitol outside of the Governor’s office in the Hall of Flags. Shortly after the press conference Governor Paul LePage finally did contact those who signed the Remonstrance saying that he never received his copy of the Remonstrance from his office staff. The Governor is set to meet with those who signed the 1/14/13 Remonstrance. 2/2/13-The Maine Constitutional Coalition meet with Governor LePage. When discussing Democratic Senate President Justin Alfond and House Speaker Mark Eves, McCarthy claims that both were guilty of “high treason”, noting that the penalty for treason hadn’t changed in a hundred years. “I believe he thinks that literally, absolutely literally. I said if you call we will come and defend you,” said McCarthy on his show. 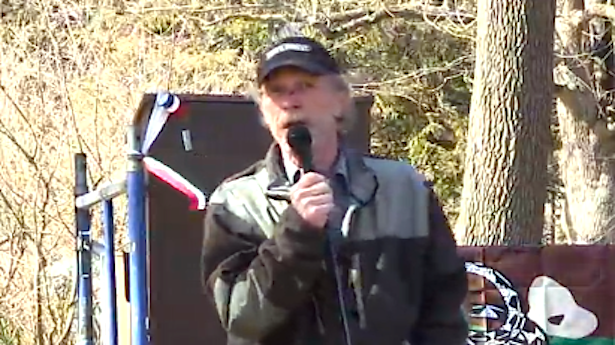 2/3/13- A video of Wayne Leach explaining the remonstrance (taped in January) is uploaded to YouTube. This video explains the work of some of the people of Maine to hold Maine’s government officials to their oaths of office. PLEASE BE SURE TO SIGN THE REMONSTRANCE SHOWING MAINE PEOPLE YOUR SUPPORT FOR THIS MOVEMENT TO HOLD THE GOVERNMENT ACCOUNTABLE FOR THEIR OATHS. 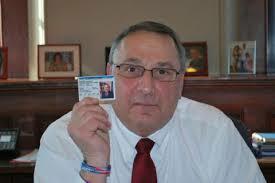 Background: Governor Paul LePage was elected with strong Tea Party support in Maine. He promised a strict adherence to the Constitutions of the United States and that of Maine. Once he took office he began the work he’d agreed to perform, but then something went amiss. It is the belief of many of those who elected him that something is keeping him from performing the [authority?] delegated to him, and to stand as trustee, as elected, by the people of Maine. It is the intention of some of these people to discover what is keeping Governor LePage from performing the duties he swore an oath to uphold. Remonstrance delivered 14 January, 2013. A response was demanded by 29 January, 2013. People in other states may want to go to the linked page and copy our Remonstrance serving them at state and local levels to suit your own circumstances. Long live the Republic! 2/4/13- Aroostook Watchmen hosts discuss with their audience the meeting with LePage. Jack McCarthy (full audio of the show), who was involved with at least one meeting with the governor, told his audience that the Coalition objected to a section of the Maine Criminal Justice Academy training manual on how to handle encounters with Sovereign Citizens. McCarthy said Phil Merletti, another member of the Coalition, showed the manual to LePage. 2/5/13- Rep. Ricky Long (R- Sherman) of Aroostook County introduces LD 220, “An Act To Ban the United Nations Agenda 21 in Maine”. The bill eventually dies in the Legislature mostly along party lines. “If newspapers would like to know who has concealed weapons permits, then they should know the governor has his,” LePage said. “I have serious concerns that BDN’s request will incite fear among gun owners and nongun owners alike regarding their safety. There is no reason why these records should be public, and I encourage the Legislature to act quickly to make this personal information confidential. 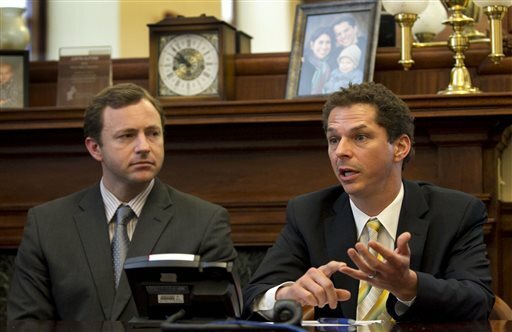 2/14/13- Governor LePage teamed up with Democratic Senate Assistant Majority Leader Troy Jackson to submit an emergency bill, temporarily and immediately blocking the release of personal information about concealed weapons permit holders while the legislature works on a permanent solution. 2/16/13- Maine Governor Paul LePage, at the invitation of the Constitution Coalition, meet and take the stage with right wing conspiracy theorist Michael Coffman of Bangor. ‘Agenda 21’ is mentioned at the 3:25 mark and the clips final comments suggests that the 1776 option (revolution) is ‘on the table’. More on Coffman, considered within the tea party/ liberty/ sovereign citizens movement to be an expert on property and economic rights, as well as an article he penned in 2014 (“The Bundy Standoff- A Century of Abuse”). Ad within the Ft Fairfield Journal newspaper available to the public outside Governor LePage’s office. 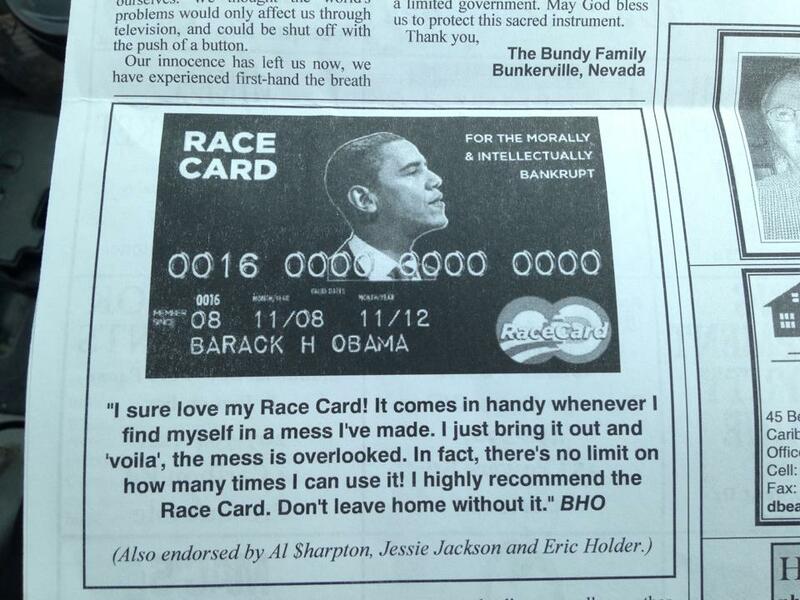 Note the reference to “The Bundy Family” above the racially charged anti-President Obama ad. “I can’t wait to hear the Bolsheviks in Bangor screaming why he would even have a meeting with radical centrists like us,” said Steve Martin, co-host of Aroostook Watchmen with McCarthy. 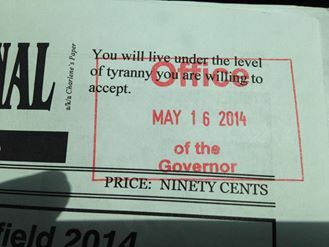 Ft Fairfield Journal available outside LePage offices and stamped as approved by the Governor’s office. None of Maine’s major newspapers are made available to the public in a similar fashion. 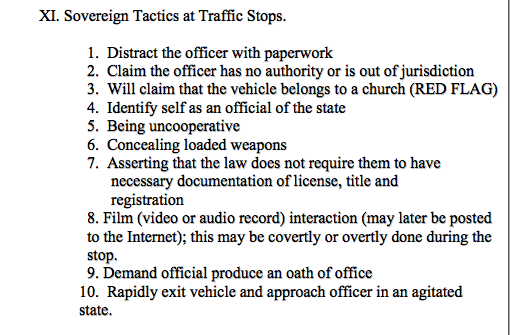 Governor LePage was asked during the meeting if this Remonstrance was the legal way to bring these points up. “His answer was, ‘Yes, this is the legal way to do this.’ So, that was encouraging,” said McCarthy. The Coalition received a signed receipt of the Remonstrance from the Governor’s office, the President of the Senate’s office and the Speaker of the House’s office. “We know that they got these hard copies of this Remonstrance.” The Remonstrance was delivered on January 14 and each office had 10 business days to respond to the grievance. 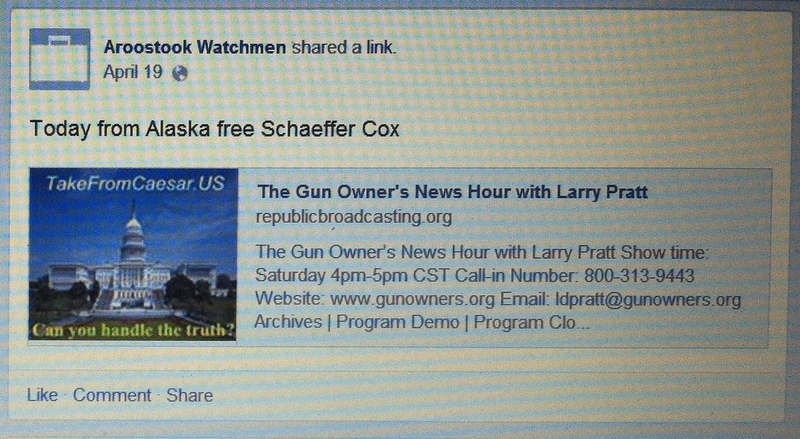 Aroostook Watchmen via their Facebook page demand the release of federally convicted domestic terrorist Shaeffer Cox. 2/24/13- News of the Maine Constitutional Coalition members meeting with LePage is shared by Gary Smart. 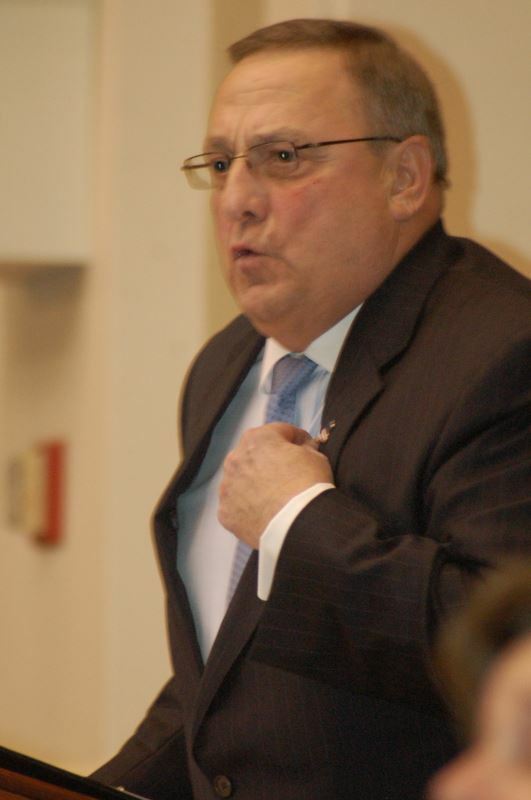 4/20/13- LePage attends and speaks at a presentation about Agenda 21, considered a conspiracy theory by the Tea Party with a goal of creating a “New World Order” stripping Americans of property rights and Constitutional liberties, at Lake Region High School in Naples along with featured speaker Michael Coffman of Bangor. 4/29/13- An “Education Remonstrance: Holding Augusta Accountable” was announced by Aroostook Watchmen on Facebook. 5/19/13- LePage unexpectedly appears at an emergency Appropriations and Financial Affairs work session, called to address his own recent claim that the Department of Health and Human Services would not be able to pay MaineCare providers past May 28. 5/21/13- LePage starts working out of offices in the Blaine House, the residence of the Governor and First Family, rather than in his offices in the State House across the street. 5/23/13- It is announced that LePage is moving his offices out of the State House and across to the street to the Blaine House, due to “efforts by majority Democrats in the Legislature to censor his speech”, citing the refusal of the Appropriations Committee to allow him to address them on May 19, and later being asked to obtain permission from the Legislative Council to have a TV outside of his office displaying the number of days since his budget was proposed. State law requires the Governor to have his office within the Capitol building, but his staff may remain there and work in his absence. 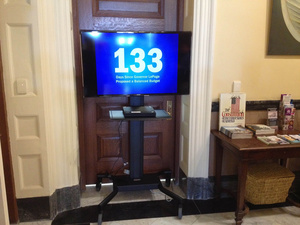 5/29/13- LePage returns to his State House offices, while still criticizing what he called censorship. 5/29/13- Members of the coalition try again with LePage, this time asking that Kennebec County sheriff Randall Liberty or a judge also be involved. As seen in this selection from the document (obtained by Mike Tipping by a Freedom of Access Act request), the governor was asked about connecting them to Sheriff Liberty or a judge. #1. Jack’s question concerning a meeting with Sheriff Liberty, to access or convey our remonstrance to the proper channel(s) (Grand Jury/Superior Court), to start legal proceedings, was never really finalized? Can you approach Sheriff Liberty or a judge to set up a meeting with us? #2. This discussion led to the fact that you were meeting with a Superior Court Judge over dinner and you said you would raise the issue of the Remonstrance. Could you share the discussion with us? Well, the mail has come, I got a bill but nothing from the alleged criminals, so we are on for tomorrow @ 1 PM at the rear entrance to the State House, and at the Capitol Police Office just inside that door to the left of the security station. I will obtain the required permit for the event. Signs are OK, but none with stakes on them inside the building. If anybody can, I’d appreciate them informing any media that we will be presenting evidence of alleged crimes within the People’s House, some of which are perjury of the oath of office, malfeasance of office, and violations of the public trust placed in the offenders by their position. This event will probably last for a maximum of an hour – probably somewhat less. Thanks to all who can attend, and bring, notify friends. 7/3/13- Governor LePage summons Kennebec County Sheriff Randall Liberty to the State House, to meet with the Maine Constitutional Coalition. It would be a great idea to have a conference of the greatest patriots to gather together to conference their ideas of a common ground plan to get their members to act upon a concerted effort to taking our individual states back to citizen authority.. This could be done through private talkshoe and private bullitan board conferences to hone out a national plan of actions that the many patriot groups of the nation could join in to do some emergency plan of actions to protect the citizens of the individual free and independent states from the federal governments Martial law plans and to bring our states back to constitutional order.I would like to add two more patriot to my list is Keith Broaders who is working tirelsessly in his endevers to bring a focus to the Sheriff community..
Also Bob Shultz for his efforts of many years battling the front lines. 7/17/13- “Aroostook Watchmen post the following “cut/paste” notification onto their Facebook wall. 8/7/13- LePage’s legal counsel submit their five page memo regarding the demands of the coalition to the governor. 10/1/13- Due to gridlock in Congress, the Federal government is shut down, with ripples being felt immediately across the country down to the local level. Governor LePage’s first response was to minimize the effect of the shutdown caused by Tea Party Republicans in Congress. “Although some positions and programs in state agencies are federally funded, all functions of state government will proceed as normal through the end of the week,” Governor LePage said. “The shutdown of the federal government is a result of the failure of leadership in Washington, D.C.
10/9/13- Maine Governor Paul LePage unexpectedly decides to call a civil emergency in response to the federal shutdown, the only governor in the country to evoke such a response to the ongoing crisis in Washington DC. 10/10/13- LePage holds an emergency meeting with some Democratic leaders to discuss his decision to declare a state of civil emergency the previous day. Towards the end of this clip, LePage discusses how the decision to declare a civil emergency came to be as part of an impromptu discussion between members of his administration. There is also some inconsistent statements regarding whether or not the state’s employee union was involved in the discussions and when, as well as meetings with Democratic leaders within the Legislature. 10/17/13- LePage visits the Cobscook Bay State Park, located and operated on land leased from the then closed Moosehorn National Wildlife Refuge. Aside from the state park itself, the area also contained a boat launch ramp used by many local fishermen. LePage criticized the federal government for interfering with the operation of a state park and closing the boat ramp. He further stated that in the event of another shutdown, he would order Sheriff Donnie Smith of Washington County, where the park is located, to keep it open if necessary. Rep. Larry Lockman (R-Amherst) and Gov. 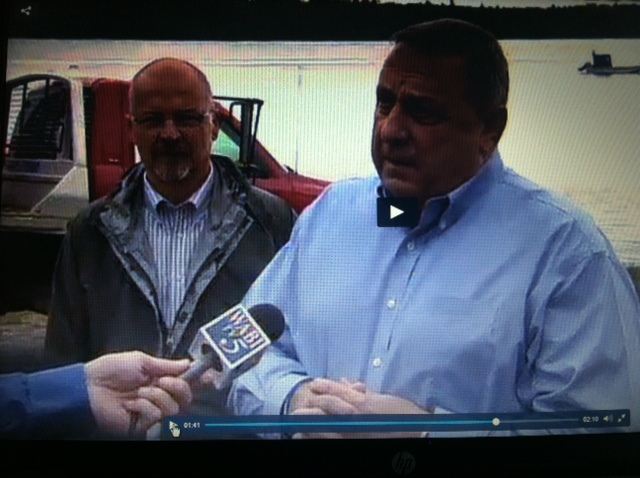 Paul LePage address media at Cobscook Bay State Park, 10/17/13 (via WABI). WABI gets video footage of the governor, Tea Party freshman legislator Rep. Larry Lockman (R-Amherst), 2CD GOP candidate Blaine Richardson and Constitutional Coalition member Gary Smart at Cobscook; only LePage and Lockman are recorded as speaking to media. 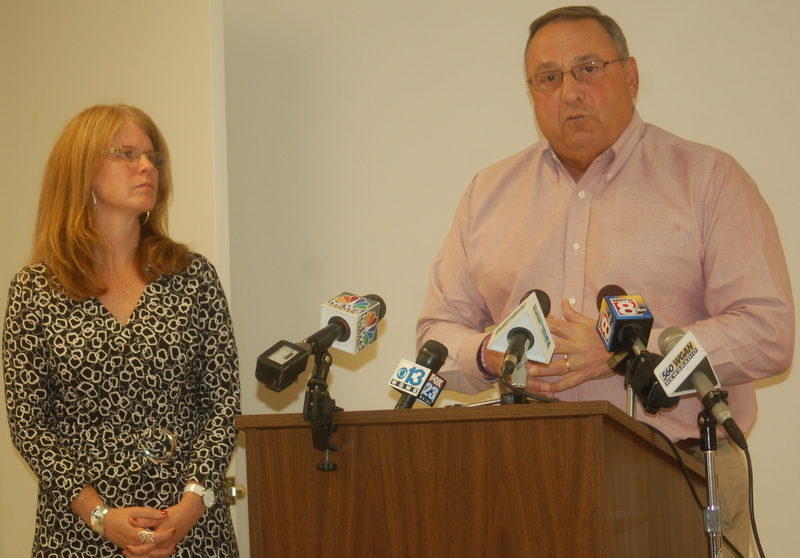 10/18/13- Governor LePage lifts the civil emergency order. 1/5/14- FOX News runs an article (“Sovereign citizen movement rejects gov’t with tactics ranging from mischief to violence”) discussing sovereign citizens within the country and some of the known patterns of dismissing their activities. Dubbed sovereign citizens by law enforcement, the movement numbers anywhere from 80,000 to 300,000 nationwide, according to experts contacted by FoxNews.com. While many live on society’s fringe and pose no immediate threat, police are being trained to be wary of sovereign citizens, knowing that they may not respect cops’ authority and could be prone to violence. The Southern Poverty Law Center, which released an authoritative study on the movement in 2010, estimated that up to 300,000 U.S. citizens consider themselves sovereign citizens, with about 100,000 being seriously involved in its techniques. FBI officials, meanwhile, characterize sovereign citizens on a wide spectrum, some dismissed as mere nuisances while others are accused of specializing in financial scams or impersonating law enforcement officers. 2/24/14- The Aroostook Watchmen again take to Facebook to inform their followers of the Governor’s handlers interfering and influencing LePage, and that they refuse to meet further with him directly. To All: O.K. people, this is it. Since we last met with Governor Lepage (the 8th time) and we refused to meet with him any more since he seems to have been fooled by his handlers, gate keepers and lawyers and supports their corrupted beliefs, we have been planning the next and probably last effort to bring the Constitution for the State of Maine, back to the Capital building in Augusta.Periodically, I have been sending out drafts of two reports call “100 Years of Law & (un)Justice”, just in case I could not finish them. Well, the reports are done and 5 Remonstrance resulted as a need to be served to the Governor and the Legislature, to be followed if we are to have our Constitutionally secured and protected rights returned. We are attending a hearing in the Capital Building, in the office of the Judiciary Committee room At 01:00 P.M. Tomorrow (02/25/2014). We had to wait until the hearing became a platform to give public opinion for the Re-Appointment/confirmation of Non-Commissioned Judges. This is it folks, we have put our life, our jobs and money, our families and repairs on cars and our homes and property on hold for this effort. If you could attend this hearing, we would appreciate your support if you can be there. I am still not sure if the Kennabec County Sheriff will be able to attend at this late date, but, we are going ahead with our plans to release the Remonstrances and 2 reports on the “100 years of Law & (un)Justice anyway. PS: Please find attached the Master file of Remonstrances and the 2 reports. In Maine We have a Constitution which is the Law of the State that is prefixed to all Legislative Law, The rest is Fraud upon the People. The State Constitution is ordained by the People by the Grace of God as Stated here in Maine. There is no law description on how we the People acquire our Property. It is true that when you finance that contract is in error. But Fraud is Fraud and that negates any contract. I financed and paid my note off to Acquire my property with the only currency available to earn money for my labor and I worked and exchanged my labor for each and every one of those FRN’s and satisfied the payment and interest of the contract and received my note marked Paid. I acquired my property. No where in in the Maine constitution, the Federal Constitution and the Bill of Rights, which are the laws of the land (Also the Declaration of Independence and the Articles of Confederation) has the people granted the government rights over our private property unless we contract those rights to someone else. SO THEREFORE I ACQUIRED, AM POSSESSING AND HAVE MY NATURAL INHERENT AND UNALIENABLE RIGHTS TO PROTECT MY PROPERTY ACCORDING TO THE LAW OF THE LAND. 15. Person. “Person” may include a body corporate. 26-A. United States. “United States” includes territories and the District of Columbia. You can beat any of these laws by stop consenting to being a Person and exerting your rights as People, it is just that simple. 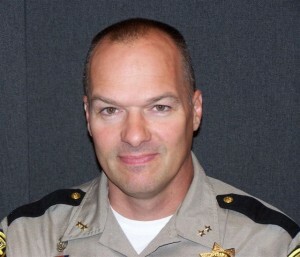 5/31/14- Coalition member Gary Smart discusses using sheriffs to arrest police chiefs and officers on a “Constitution Club” forum discussion on rights to travel. I was just talking with a man this morning about some possible campaigns on this driving vs traveling issue. We are individual attacking this issue, but if we organize a 25 man Board of review Article 61 Magna Carter and walk into the Sheriffs Department and present the known laws and rights of the people and organize the law of the county and shared among many counties. This needs to be organized and discussed on common grounds and bring about a formal complaint to the sheriff, and then start arresting Cheifs of Police and police officers for UCC241 violations to people rights. This simple procedure would work in Administrative (unlawful) courts. 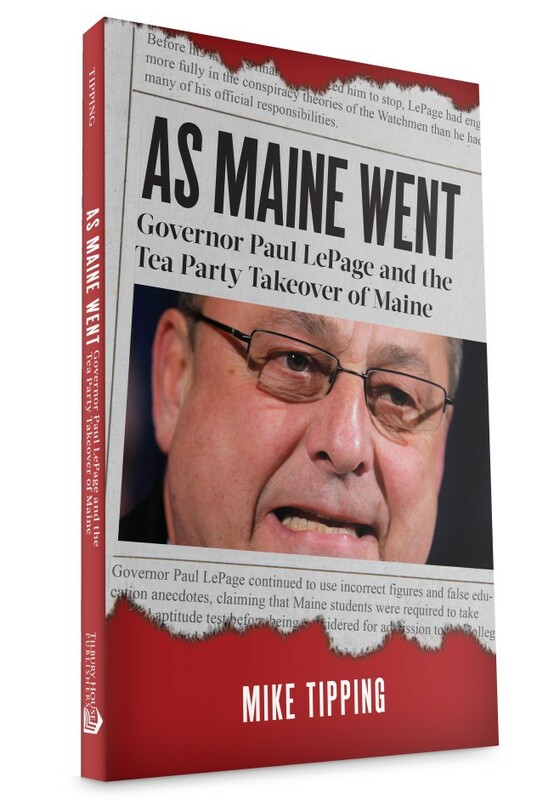 6/30/14- Excerpts from the first chapter of Maine People’s Alliance communications director Mike Tipping’s book, “As Maine Went”, are released. The focus of the beginning chapter are details of the eight meetings between Maine Governor Paul LePage and the Constitutional Coalition members. This sparks multiple news stories, opinion pieces, examinations, interviews with many concerned and more, as listed below in chronological order. McCarthy, whose Sovereign Citizen ties include the Constitutional Coalition, says that he was at the State House to discuss the group’s concerns with the governor. Among those topics, McCarthy says, was their belief that Democratic Maine Senate President Justin Alfond and House Speaker Mark Eves should both be tried for treason. “And we also discussed this there, that as far as I know, the penalty for high treason hasn’t changed in a hundred years, and I didn’t say it, but the governor said it – I never opened my mouth and said the word – the governor looked at us and looked at his buddy and said, ‘They’re talking about hanging them,’ “ McCarthy said. “That’s right,” (co-host Steve) Martin responded. “I said, Praise the Lord – we’ll hang a few and be done with this crap,’ ” McCarthy said. “I was never in the room where ‘execute’ was used,” the governor said in a phone call to the BDN managing editor. “It never happened,” he said later in the call. “We did not discuss execution, arrest or hanging.”When told that the audio of the show was included on Tipping’s blog, LePage said he wanted to see the tapes. “None of this stuff ever happened,” he said again. He said he talked with the group about the U.S. and Maine constitutions. Further, he said, he disagreed with much of what the men said. Liberty did not know it at the time, but LePage had called him in for a meeting with members of the Constitutional Coalition, a group that progressive blogger and Democratic activist Mike Tipping says has direct ties with a national movement known as the Sovereign Citizens. The group has been linked with violent acts against public figures in other states, and its members reject taxes, the U.S. currency and perceive the U.S. government as illegitimate. Liberty says the group wanted a sheriff to help them deliver their grievances concerning a list of constitutional infringements. Liberty says he accommodated the group’s request, delivering the message to the respective staffs of the three elected leaders, all Democrats. Liberty says he though he’d completed his assignment, but then he heard from the coalition again earlier this year. This time, they wanted Liberty to arrest the the speaker of the House, the president of the Senate and the Maine attorney general on charges that ranged from dereliction of duty to treason. “We almost begged them (lawmakers and others) to respond in some fashion, either negatively or positively,” Leach said. He doesn’t want to sue Tipping, perhaps, but there is bitterness about the way he was characterized. With that in mind, Merletti points to the far end of the room. When the coalition met with LePage, it was directly, Merletti said. No lawyers, no gatekeepers. The flow of information was unrestrained. Evangelos asked the attorney general’s office to investigate what happened during the more than 10 hours of meetings LePage held with the group. On Friday, the AG said she would not investigate because LePage’s Executive Protection Unit — sworn law enforcement officers charged with protecting the governor — was present for the meetings and did not see fit to follow-up on anything discussed at the time. In an email to Attorney General Janet Mills on Friday, Evangelos said that wasn’t good enough. “Gov. Paul LePage apparently doesn’t understand a simple concept: As the state’s chief executive, he harms the reputation of the state by repeatedly indulging people who believe the current government is acting illegally, talk in strange ways about a new world order, urge people to not pay taxes, don’t believe President Barack Obama is a U.S. citizen, think the federal government is stockpiling ammunition to use against civilians, publicly discuss mind control, and believe the massacre of schoolchildren in Newtown, Conn., was a government-orchestrated attempt to restrict Second Amendment rights.It doesn’t matter if the people who met with LePage haven’t acted violently in the past; their views are so dissociated from reality they taint the credibility of anyone who takes them somewhat seriously. The fact that LePage met with them multiple times, when he could have been addressing the state’s real problems, shows a severe lack of judgment. Prosecutors said McCarthy essentially challenged the legality of the requirement that drivers obtain and renew a license, arguing the government was too intrusive and did not have the authority to regulate driver’s licenses. The jury took just 15 minutes of deliberations to convict McCarthy, who was fined $200 on the first charge and $400 for the second one. The group (Constitutional Coalition) has been linked with the Sovereign Citizens, which is described as a terrorist movement by both the federal government and the Maine Department of Public Safety. On May 21, according to reports in the Lincoln News, fellow constitutionalists Gary Smart was arrested after an encounter with officers of the Lincoln Police Department. After being pulled over for expired registration and inspection stickers on West Broadway in Lincoln, Smart apparently declared himself a “sovereign citizen” and refused to exit his pickup truck until a member of the Penobscot County Sheriff’s Department was present. (Sovereigns believe that elected sheriffs are the only legitimate law enforcement officials.) Local officers eventually removed Smart from the vehicle and placed him in handcuffs. Smart was also later charged with operating without a license and violating the conditions of his release, according to the Lincoln News. Smart, like McCarthy, is defending himself in court and has posted some of his legal submissions to his website. They contain textbook Sovereign Citizen rhetoric, including the misuse of legal terms, allegations that the government is illegitimate and quotes from bible verses and precedents from the 1800s that he says prove he is above the law. – When John Walsh claimed a false arrest and I requested a Sheriff or deputy Sheriff who is a proper law enforcement, commissioned officer, the three named corporate franchised persons of the District of Columbia denied me proper due process of law according to their sworn oaths to God and the People of Maine. – All without my consent or due process of the law of the land that these men swore an oath to God and the People of Maine to uphold the constitutional laws. * While at the Lincoln Police Department these men wrote two violation summons and complaints to a court hearing for offenses that do not apply to me being a private man who is one of the people of Maine. – These violations are for fictions in law which are identified as body corporate while I am a man who is one of the People of Maine as identified in the Constitution of Maine. – I am not a Person because that is being a man of sin as identified in James 2:9 “But if ye regard the persons, ye commit sin, and are rebuked of the Law, as transgressors.” I am a man who does not knowingly sin against the natural laws of my God, the Sovereign Ruler of the Universe. – The jurisdiction of the Maine Revised Statutes is not my venue, where as that venue is the private State of Maine Corporation that is a territory of the District of Columbia and a franchise of the 1871 corporation of the United States which I hold no known contracts with. – Any contracts franchising with the United States that might identify me as being a person is a fraud which is “Any trick or artifice employed by one person to induce another to fall into an error, or to detain him in it, so that he may make an agreement contrary to his interest.”(1856 Bouvier) Because this fraud may consist either, first, in the misrepresentation, or, secondly, in the concealment of a material fact. Fraud avoids a contract, ab initio, both at law and in equity, whether the object be to deceive the public, or third persons, or one party endeavor thereby to cheat the other. * Therefore a violation of Maine Revised Statutes 29-A §2412-A. Operating while license suspended or revoked is not a valid summons. Not only that it would be an invalid law because it violates a free man’s natural inherent and unalienable rights which all government personnel swear an oath to honor under their duties of the constitution and the supreme court has been ruling in that favor for years. So the driver’s license was a fraud in the first place and to operate as a free man of Maine makes an operation after suspension a fraud which avoids a contract, ab initio. * Therefore a violation of Maine Revised Statutes 29-A §351. Registration required is not a valid summons. Not only that it would be an invalid law because my vehicle is my personal private property that the State of Maine has no constitutional authorization to require registration and fees because such laws do not either defend my rights or benefit them by any reasonable nature of natural law. * Therefore the violations of 29-A §2412-A. Operating while license suspended or revoked and 29-A §351. Registration required are not valid and I have not done any harm or violated rights to any other man or woman I shall declare that these summons for violations are dismissed by my authority as a man and one of the people of Maine. because I did inform them that I was one of the people of Maine, I had a free right to travel, meaning upon the highways and they ignored my venue and made the assumption that I was of their jurisdiction after I informed them differently. But a Republican strategist, also not active in the gubernatorial race, said the revelations are both demoralizing for the governor’s staffers and could genuinely harm fundraising. “I was never in the room where ‘execute’ was used,” the governor said in a phone call to the BDN managing editor. When told that the audio of the show was included on Tipping’s blog, LePage said he wanted to see the tapes. “They got mad and called me all kinds of names,” he said. Yesterday evening, Governor LePage claimed that he never discussed the arrest of Speaker Mark Eves and President Justin Alfond for treason during his meetings with Sovereign Citizens. For one example, please see this document titled “Subject for discussion #1” sent to Governor LePage and his staff by Jack McCarthy before one of their meetings with the governor in May, 2013. Not only does it mention some of their previous conversations about the subject and steps LePage has taken to further their cause, but it warns that their options are diminishing and “we will be left with the 1776 or the 1865 option.” 1865 was the year President Lincoln was assassinated. I look forward to receiving LePage’s notes from these meetings, which I have again requested and which are apparently written in code. I also look forward to hearing more about his plans to sue me. Here is that document referenced above by Mike. And so much for LePage’s claims last night to the BDN’s managing editor that such a five page legal memo arranged by his legal counsel didn’t exist! “There is no place for this. It’s completely unacceptable. Gov. LePage owes the people of Maine an explanation and should denounce this at once,” Michaud said.